Alek Wek fled to Britain with her family at 14 to escape the first civil war in the Sudan. By her early twenties, she was a supermodel and muse who had become the first African woman to grace the cover of ELLE. Wek’s prestigious modeling career has taken her around the world, but she hadn’t been to her homeland in years. That changed when she visited the South Sudan for the nation’s one-year independence anniversary in July. Wek teamed up with the United Nations High Commissioner for Refugees (UNHCR) to help the South Sudan develop economic and agricultural stability. Now one of the world’s youngest nations, the South Sudan faces several challenges because of fighting at the border (stemming from the second civil war, which ended in 2005), climate issues which can make land unlivable, and lack of resources including food, water and education. Also, about 175,000 refugees who returned to South Sudan still need resources to help them sustain themselves as well as build a stable infrastructure for their nation. Wek visited Wau, her hometown, Juba, the capital city, and various other regions of the South Sudan where she got to speak to displaced people and convey their needs to the country’s president, who is putting his faith in the youth, some of whom were born elsewhere because their parents fled. Wek, who lights up when she describes education as “everything,â€ learned from her parents at an early age to make acquiring and applying knowledge her top priority–it’s a message she consistently spreads, which is why she teamed up with UNHCR to help build schools, one of the most important things she feels the South Sudan needs. Oprah once told Alek Wek that had she seen her on the cover of a fashion magazine as a child, her own concept about herself would be different. Imagine how the Sudanese children feel, who see Alek Wek, the model, the entrepreneur and humanitarian. 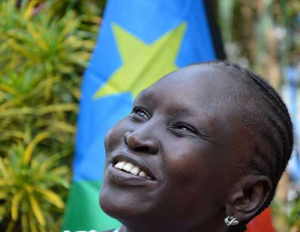 Wek jokingly says that her Dinka heritage makes her tenacious but she has witnessed people coming back from various clans andÂ the fact that she was embraced by the people in her country after years of being away, as if she never left, speaks volumes to Wek’s hopefulness and the resilience of the South Sudanese people.